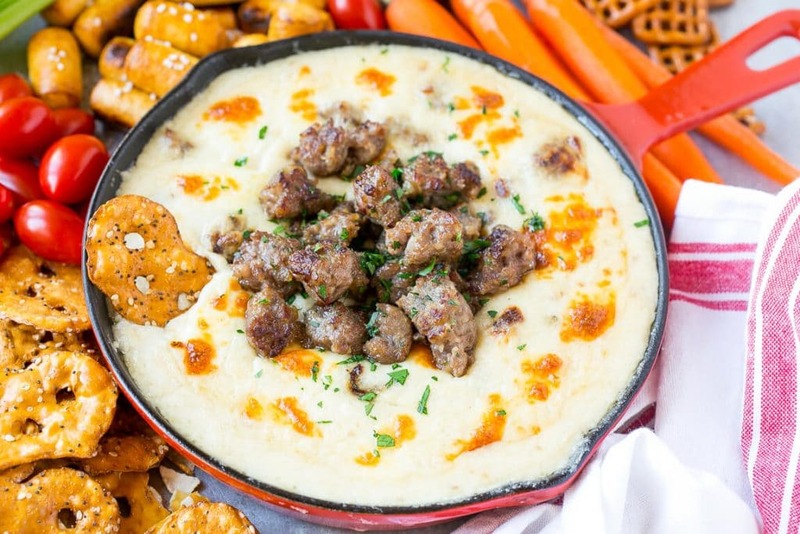 This Wisconsin brat & beer cheese dip is creamy, cheesy and loaded with bratwurst. It’s a hearty appetizer that’s perfect for game day entertaining! 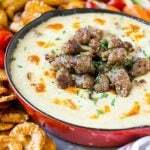 You can never go wrong with a cheesy dip, I serve pizza dip, crab dip or this hearty beer cheese dip at all of my gatherings. All of your guests will be asking for the recipe! The holidays are over, but that doesn’t mean the food and fun has to end! 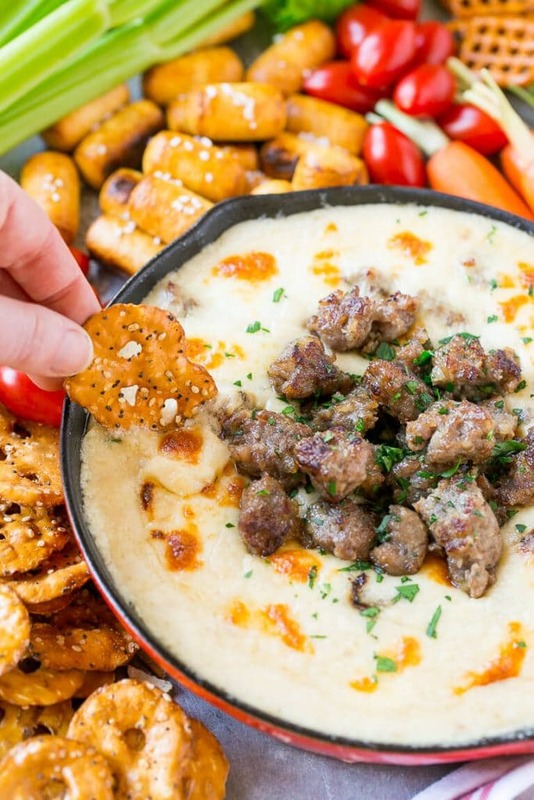 This brat & beer cheese dip is for all of you Wisconsin professional football fans out there – because there’s nothing better than creamy cheese paired with beer and sausage, am I right?! How do you make beer cheese dip? This amazingly delicious dip was created by the McCormick kitchens and is part of their 50 Dips for 50 States project. McCormick took the signature flavors of each state to help you elevate your “bowl game” and help you bring your team spirit to the table. I want to try all of the dips, they look fabulous! This brat & beer cheese dip is made with some of Wisconsin’s finest foods – bratwurst, beer, cheddar cheese, and cheese curds. 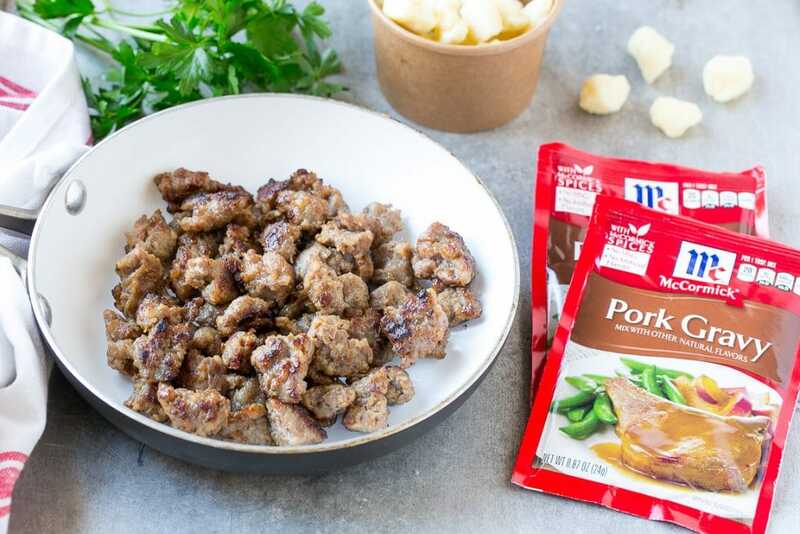 All of these flavors come together so nicely with the help of McCormick Pork Gravy. I love how simple this dip is to prepare, and it’s always a huge hit with my family and friends. I used a sharp white cheddar cheese for the base of the dip, but feel free to use a different variety of cheddar cheese if you prefer. What kind of beer is best for beer cheese dip? For this dip, you’ll want to use a milder flavored beer, and be sure to use a beer that you like to drink! I recommend using a lager style beer which pairs perfectly with the sausage and cheese. I like to serve this dip with everything pretzel – soft pretzel bites, pretzel chips and pretzel squares. I also put out an assortment of fresh veggies so that there are plenty of dipping options to suit everyone’s preferences. Other great options are crackers, sliced baguette or breadsticks. The cheese curds melted over the top just might be my favorite part of the whole thing. 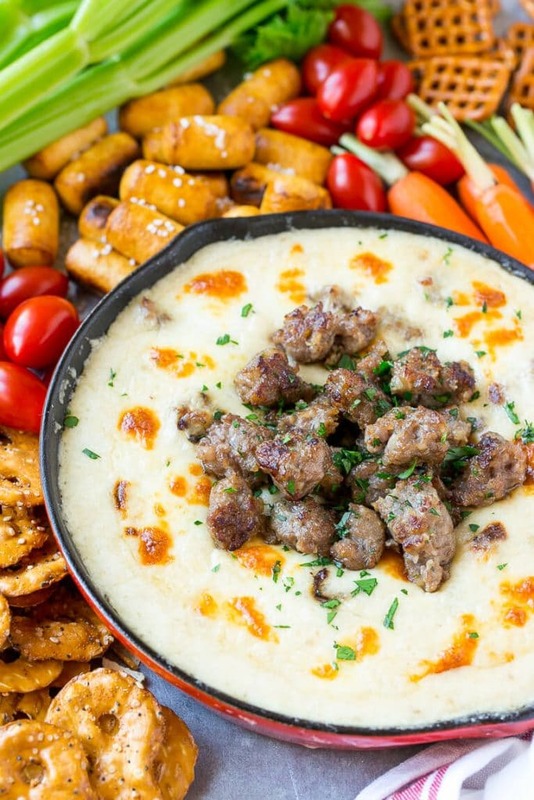 Football food is some of the best kind of food, and this dip definitely doesn’t disappoint in that area. I’m making this dip for my football viewing party this weekend, and I know it’ll be the first thing to disappear! 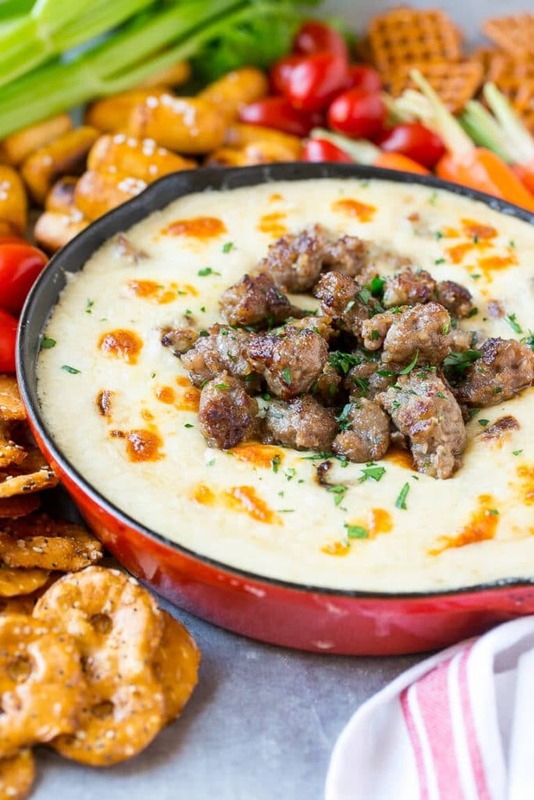 This Wisconsin beer cheese dip is loaded with cheddar cheese, sausage and beer - perfect game day food! Recipe courtesy of McCormick. Preheat oven to 350°. Cook and crumble sausage in large skillet on medium-high heat until browned. Drain fat. Remove from skillet. Set aside. Melt butter in same large skillet on medium heat. Sprinkle with flour. Cook and stir 1 minute. Gradually stir in milk, beer and Gravy Mix with whisk until smooth. Stirring constantly, bring to boil. Reduce heat and simmer 5 minutes or until sauce starts to thicken. Gradually stir in shredded cheese until melted and smooth. Stir in cooked sausage. Spoon into 9-inch glass pie plate. Sprinkle with cheese curds. Bake 15 minutes or until cheese melts. Serve with soft pretzel bites or pretzel chips. Garnish with crumbled sausage and parsley if desired. This post is sponsored by McCormick. Thank you for supporting the brands that make Dinner at the Zoo possible! Can I substitute some other liquid for the beer? You can use chicken or beef broth! Do you think half & half can be used in place of milk and cornstarch in place of flour? That would work, but for the cornstarch it needs to be in liquid to thicken, so instead of mixing it with the butter, dissolve the corn starch in cold water and add it towards the end. I would start with 2 tablespoons cornstarch and then add more if needed. Mmmmm…..I live in Illinois ánd I have never seen cheese curds in the grocery store. I get cheese curds when going out to eat! Please help! Thanxs! If you can’t find them, you can add shredded white cheddar cheese on top! I am in California, so it took a little searching for me too. I found them in the specialty cheese area near the deli at my grocery store, they’re not in with the regular blocks and shredded cheeses. 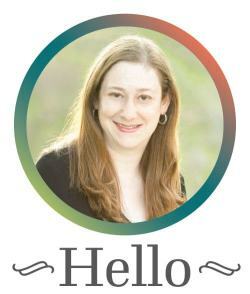 Is it possible to maybe make in a crackpot? I want to make this for a potluck we are having at work on Friday. Go Pack Go! I think you could make the dip in advance and re-warm it in the crockpot, it reheats well! My husband would really enjoy this dip while watching the game! Will give it a try! Go Wisconsin! 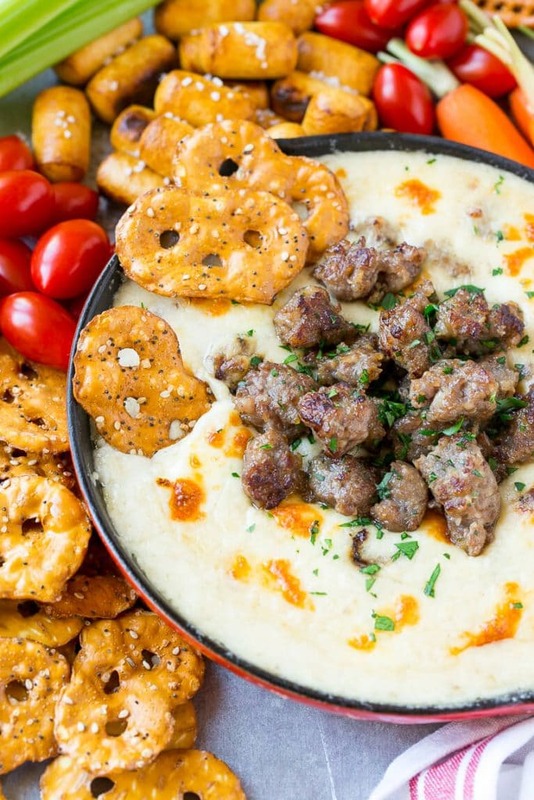 Perfect football gathering dip! That dip looks amazing! I know what I am making on Sunday! My buddies will inhale this awesome cheese dip! Headed out later today to get the ingredients!